But then Pen Pusher’s fate – however fantastically bad the editors’ handling of it – is only the latest in a long line. It can sometimes seem like all the best indie poetry mags have bit the dust. Flick through the acknowledgements pages of poetry collections from the late 80s and 90s and you find all sorts of curious names: The Wide Skirt, The Echo Room, joe soap’s canoe, Blade, Thumbscrew. Exciting, independent, underground and – in the latter’s case – fun-poking (if a little blinkered by its own meanness), these mags are now, sadly, all gone. Then once in a while something turns up: online, in the post, by word of mouth. 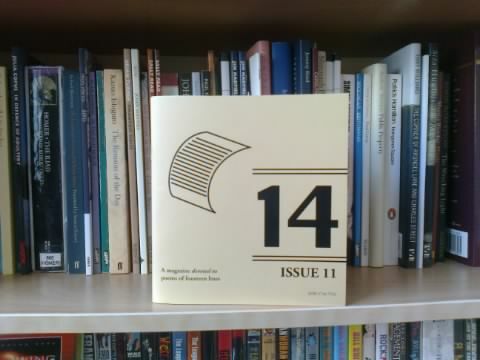 Another small mag, you think, which, as the best new poems continue to wing their way to premier league and championship types – Poetry Review, The Spectator, the TLS; Poetry London, Magma, New Welsh Review – will probably fall short. Cynical, maybe, but so often new publications lack real selling points: something unique to fill – that terrible phrase – a gap in the (already tiny) market. By that I don’t mean a half-baked editorial stance like Popshot’s, where ‘making poetry accessible’ amounts to little explanations at the bottom of each page (something you’d think a barely disguised insult to readers and contributors alike, were it not done so earnestly, and with such awful, naïve gusto). No, I mean something like Thumbscrew’s off-kilter tastes and raucous odds and ends; something like – though it's not what it once was – the unique little features and layout experiments of The North, who for a time printed new poems without authors’ names. (The thinking being that poems should stand on their own merits, not merely a poet’s track record). Fourteen is one such magazine: a stylish but unfussy indie production that’s been steadily building its small reputation, bit by bit, over the past six years. I first came across it some four or five years ago, and found good stuff to enjoy in its charming, staple-bound pages, not least a neat little poem, “Girl Playing Sudoku on the Seven-Fifteen”, by Rob Mackenzie. I ordered the guy’s pamphlet. And on the strength of it and the other poems inside, subscribed to Fourteen. It wasn’t long before I wanted to see my own poems in there. All things that swiftly mark out a good indie poetry mag from the rest, how it keeps going and, of course, why there’s so few of them about. Dedicated to poems of fourteen lines, Fourteen ranges from formal sonnets to looser experiments; from metaphysical, meditative stuff to light and funny pieces. The editors’ tastes seem broad but discriminating. Peppered with quirky, eerie drawings by Clare Johnson, the latest issue is an eclectic mix of consistently good writing: the twisting, how-serious-should-you-take-me tone of John Whitworth’s “The Fat Clock”; the frail elegance of Andrew Marstrand’s “Unseparate”; Kristian Wiese’s atmospheric “Poem” and its tumbling lines, to pick out just a few. But see for yourself. Go and buy an issue from their site. If you like it, subscribe. Maybe there is an especial lack of quality indie poetry mags these days, compared with the situation ten or so years ago – I don’t know. But what’s clear is that mags like Fourteen stand above most, warrant support, and deserve a wide readership. It's certainly hard to blunder through all the tiny mags to find those worth sticking with... thanks for the review. I would have thought Pen Pusher's 'get lost' was illegal, actually, if they've taken money for a product and not supplied it. very kind review Ben. Rosemary I am pretty sure you're right about Pen Pusher (sad to see it gone) and I'd like to reassure Ben's readers I keep detailed accounts, including records of how much each individual subscriber has paid up in advance. I dread to think 14 would get close to the stage of having to stop, but if it did it would plan ahead for it and reimburse everyone accordingly. (Just in case you're worried). But let's not get to that stage! Finally, in this slightly long comment, please use Ben's link to 14's own website above for the latest address and details - rather than the Poetry Kit indie mag link, which has old info, and I've emailed Poetry Kit about this. Hope to hear from some of this blog's readers in the future at 14.